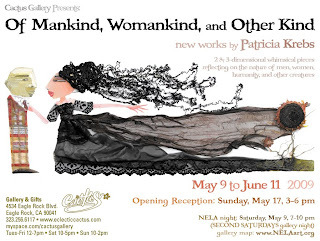 Cactus Gallery is proud to present "Of Mankind, Womankind, and Other Kind," a solo exhibition by mulitimedia artist Patricia Krebs. For “Of Mankind, Womankind, and Other Kind,” Krebs created a series of whimsical 2 & 3-dimensional pieces that reflect on the nature of men, women, humanity and other creatures. 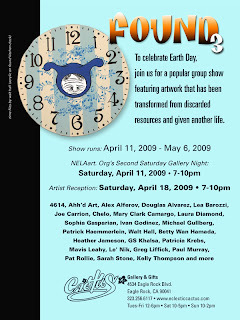 She will also show pieces from her last two series: "Guardianas" –strong female protectors of the earthly realm who can also inspire our dreams in a playful way and “Animas in the Matrix” –wall sculptures made of disassembled electronic and natural elements that explore contrasts. Krebs grew up in Buenos Aires, Argentina, where she graduated with the degrees in Fine Arts and Contemporary Visual Arts. Over the last thirteen years, Krebs has worked independently as a singer, songwriter, producer, illustrator, portraitist, designer and puppet maker. She moved to Los Angeles eight years ago. In her work, whatever the medium, Krebs talks about life: the complexity of humanity, the connections within ourselves, between each other, and to the Earth. “By means of their rare beauty and humor, my characters would want to stir our thoughts, provoke feelings, evoke memories or create fantasies” she says. Come delight in the promise that FOUND art communicates. Our FOUND artists have transformed the ordinary into the beautiful. They’ve collected discarded resources--used, abandoned or recovered materials, and given them another life. Thank you for your continued support of the arts. Art enriches our lives and brings us together.